A key to a great purchasing experience is providing users with simple and fast payment methods. 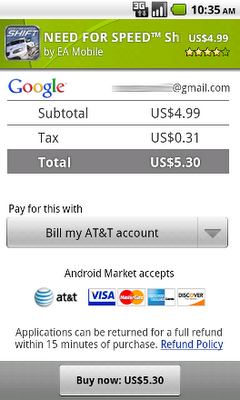 The Android Market team has been working hard to deliver more forms of payment to further reduce purchase friction. Today, I am pleased to announce the availability of AT&T Direct Carrier Billing for Android users on the AT&T network. AT&T Android users can now easily charge their Android Market purchases to their monthly accounts with only a few clicks. With the combination of Android Market’s new app discovery features and a carrier-backed frictionless payment method, users will find it significantly easier to discover and purchase applications of their choice. We’ve been rolling out Direct Carrier Billing to all AT&T users over the past several days, as part of a general update to the Market service. Also in the update, please watch for the arrival of new features we announced recently, including the 15-minute refund window, dynamic Wallpaper and Widget categories, new 50MB max .apk size, and more. In addition, we’ve added even more categories to make it easier to find great apps in popular categories, such as “Media & Video”, “Music & Audio”, “Business”, “Sports” (in "Games"), and more. If you have one or more published apps on Android Market, please take a look at these new categories and decide if they are more suitable for your products. We strongly believe carrier billing is a great way to make it easy for users to purchase and pay for applications. In addition to the availability of AT&T and T-Mobile US carrier billing, we’ll continue to partner with more carriers to offer carrier billing options for their subscribers. 2010 has been an awesome year for Android due in large part to your support. We have seen tremendous growth in Android Market both in terms of application volume and quality. In 2011, we remain committed to making Android Market the best mobile application store possible. As always, please don’t hesitate to continue giving us feedback through Market Help Center.